The water revolution is here, according to Stanley Weiner, CEO of STW Resources—a Texas-based company that has the exclusive North American license for Dutch-developed next generation Salttech desalination technology. James Stafford: A global study warns that by 2030 demand for water will outstrip supply by 40%. What are we facing in the US alone? Stanley Weiner: The situation can only be described as extremely urgent. We’re looking at continual drought and predictions of a new ‘mega drought’ for Texas. The current drought started in 2010, and it’s still in play. In the meantime, we’re seeing a lot of new people moving into Texas, as well as industry, and they all need water that they don’t have. California is running out of water. A NASA scientist has recently warned that California has only about one year’s worth of water left in storage, while its groundwater is rapidly depleting. According to scientists, 40% of the state is undergoing an ‘exceptional drought’—the most severe it has seen in 1,200 years. Earlier this month, California Governor Jerry Brown issued the state’s first-ever mandatory water restrictions. It sounds apocalyptic because it is, even if we don’t feel it immediately. And a dry California is a disaster for the entire US. California is our breadbasket—where more than one-third of our vegetables come from and some two-thirds of our fruits. What it means immediately is higher food prices across the US. It’s not enough anymore to think that if you don’t live in a dry state you won’t be affected. The water crisis affects us all in many ways. Parts of Oklahoma are hard hit by drought. Drought conditions have intensified in Nevada and Utah, and Arizona is facing a similar problem to California—it’s growing thirstier by the day. Water is behind every single sector of our economy and our way of life. It’s more valuable than oil because at the end of the day, there is no oil without water. It’s important that everyone understands that finding a solution for our growing water crisis is hands-down the most important endeavor of our time—from both a human and an industrial standpoint. James Stafford: Ok, so where do we stand today in terms of new technology that can address urgent water supply issues on a global level? Stanley Weiner: Until recently, new technology that could realistically address urgent issues of water supply around the world had been relegated to the realm of science fiction. Even though the technology has existed and was continually advanced, it was unfeasible on a commercial scale—until now. So what we’re seeing today is a breakthrough that is far more significant than the technological advancements in horizontal drilling and hydraulic fracturing that ushered in the shale revolution. Today, we can provide a solution to droughts; we can provide dry communities with more drinking water than they ever could have imagined—and we can prop up the shale boom by providing drillers with more sources of water, ultimately leading to America’s energy independence. We can also economically recycle the water they use in the process. James Stafford: What you’re describing is no less than a water revolution, then? Stanley Weiner: Absolutely. This is a revolution, and it’s only just emerging, so we can expect a lot of technological advancements along the way to make desalination even more efficient and cost-effective. But there is no turning back now. Everything is connected to everything else—that’s the first message to be heard loud and clear from this emerging ‘water revolution’. Tighter environmental regulations have expanded the market for companies that encompass not only the use of ‘green’ technology, but also of ‘blue’, or clean water technology. But there’s a third color here that is just as important, and we’ll call it black, which means it has to make sense economically. Until now, desalination technology has been too expensive, with projects operating in the red, rendering them economically unfeasible on a commercial scale. ‘Blue’ technologies have also until now not been ‘green’ enough to make sense for the environment. Stanley Weiner: First off, this is largely mobile technology, so it’s easy to set up in all kinds of venues and to move around, which also contributes to cost-effectiveness, but it can also be a fixed facility situation. What it does is this: It takes dirty water and turns it into potable water using vaporization. It can clean up the oil industry’s frack flowback water and the dirty water produced by oilfields, and it can also desalinate ocean water. James Stafford: And how does it work, exactly? There has been a lot of talk lately about thermal distillation using Dynamic Vapor Recompression (DVR), but for the layman, what does this mean? Stanley Weiner: OK, yes, DVR is a key aspect of the Salttech desalination system. DVR is a new type of mechanical vapor recompression—which is the process of evaporating water at moderate temperatures through the use of a vacuum and then condensing it in a higher-pressure chamber. The heat of condensation is transmitted to the influent stream through a heat exchanger. All of this requires very little energy compared to conventional process that rely on “flash distillation” and large amounts of energy. Where the term “dynamic” comes into play in the DVR is in relation to the use of a cyclone during the evaporation process. This cyclone separates the crystallized salts from the brine by centrifugal force. James Stafford: On a ‘green’ level, how is this new generation technology different? What makes it actually ‘green’? Stanley Weiner: The key aspect of this technology is what we call zero liquid discharge (ZLD). All these ‘permanent’ desalination plants that are being put up around the world—including nine just in Texas and one in Carlsbad, California—are harming the fragile ecosystem of our oceans and waterways. 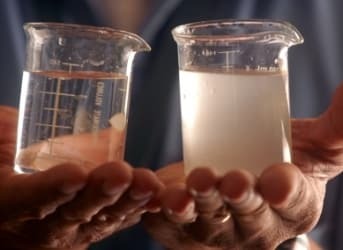 They can’t process more than 35-50% of the water in the desalination process, and what they don’t process into potable water is rejected back into the ocean in the form of harmful liquid discharges. Studies have found that if they are processing 50 million gallons a day, they are putting 25 million gallons of harmful liquids back into the ocean. The studies are frightening, and they will impinge on the ability of these plants to get permits to keep feeding reject liquids back into the waterways. In Israel, for instance, there are contracts to build these permanent desalination plants, but now it looks like the permits aren’t going to come through. James Stafford: So how does the Salttech system avoid rejecting harmful liquids back into the waterways? Stanley Weiner: First, this new technology processes around 97% of the water, so there’s much less rejected. Second, the 3% or so that it can’t process, it turns into a solid, so there is zero liquid discharge. And there are no chemicals used in the process whatsoever. Let me put it this way: the ‘permanent’ desalination plants are discharging 50-65% of what’s rejected in the process in the form of a waste stream of highly concentrated brine liquid—directly into the oceans. The new mobile technology, developed by the Dutch, discharges its 3% reject in the form of solid salts and minerals, so there is no harmful discharge into waterways and no disposal problem. Importantly, this means there is no need for deep well waste water injections, evaporation ponds and other recognized methods for disposing of concentrated brine waste from desalination activities. James Stafford: How do the costs compare with conventional desalination technologies? James Stafford: How important is water to the overall energy equation? Stanley Weiner: It’s absolutely a vital part of the energy equation. Water is what enables the US to drill more oil and gas wells and to wean itself off of foreign oil and reduce vulnerability to geopolitical whims. James Stafford: Is there a point at which the energy industry—one of the bigger consumers of water itself—can actually contribute to the solution rather than the problem? Stanley Weiner: Oilfield water use represents much less than people think: It’s only about 3% of total fresh water consumed. For 2005, most of the fresh-surface-water withdrawals—about 41%--were used in the thermo-electric power industry to cool electricity-generating equipment. Water used in this manner is most often returned to the water body from which it came. That is why the more significant use of surface water is for irrigation—in the agricultural sector—which uses about 31% of all fresh surface water. Ignoring thermoelectric-power withdrawals, irrigation accounted for about 63% of the US’ surface-water withdrawals. Public supply and the industrial sector were the next largest users of surface water. However, the energy industry can still contribute to the solution in a significant way through water reclamation. Just like we drill for new oil and gas, we can drill for new sources of water deep underground and tap into water resources that were never before accessible for potable water. James Stafford: Where can we find new sources of water and how do we tap into them? Stanley Weiner: The new sources of water aren’t really new at all—they’ve always been there; we just didn’t have the economically viable technology to tap into them on a commercial scale. These sources include the ocean, brackish water from reservoirs deep underground and municipal wastewater, which will be tapped into using our toilet-to-tap technology. James Stafford: What will the next advancement in desalination technology be that will render it even more economically rewarding? Stanley Weiner: Now that it’s already commercially viable, the next step will be to lower the energy costs even further with wholesale solar, wind and geothermal power. In fact, the first desalination plant already in operation in Mentone, Texas, is entirely run on solar power and is providing the city of Mentone with as much drinking water as it could ever want. James Stafford: This technology was first deployed in Mentone, Texas? Stanley Weiner: Yes. This is where it really all started in July last year—in this small town in the Permian Basin. This was a highly successful pilot project that is now providing residents with all the drinking water they need. And, as I mentioned before, the entire operation is run on solar power. It was this system that convinced me of the viability of licensing it and commercializing it to make water available to everyone in need of it. But Mentone was just the genesis of this water revolution. The desalination project in Fort Stockton—also in Texas—is much larger. Right now, in Fort Stockton’s Capitan Reef Aquifer we are drilling our first production well, and will be drilling several additional wells here and in other brackish aquifers. We’re drilling to new water sources about 2,000-4,500 feet under the surface, to tap into as much as 14 million acre-feet of new water—or about 5.6 trillion gallons. In the second quarter of this year we will start selling that water. The beneficiaries will be several west Texan municipalities suffering from drought. James Stafford: What about the oil and gas industry? Are they jumping on this water revolution bandwagon yet? Stanley Weiner: Our pilot project in the Permian Basin has definitely attracted the attention of oil and gas companies who are hurting for water supplies and struggling with low oil prices and thus have problems justifying costs. You have to understand that Texas is both a highly competitive playing field for oil companies—with the sleeping giant that is the Permian Basin and the prolific Eagle Ford shale—but it is also water starved. So the competition for water resources is just as competitive as the competition for oil and gas licenses. There is also a great deal of competition among industries who are heavy users of water. With the advent of hydraulic fracturing—which uses exponentially more water—this competition has grown even fiercer. Demand for water is soaring, and now we can meet that demand. Over half of the 40,000 wells Americans have drilled since 2011 have been in areas of drought, and in total these wells have used 97 billion gallons of water. Over the next six to nine months, we will be launching another major desalination project for an NYSE-listed oil and gas company—so the word is out. James Stafford: Specifically, how much money could oil companies potentially save in Texas’ Permian Basin or Eagle Ford using this technology? James Stafford: What is the future of water reclamation and desalination? Where do you see the technology going over the next 5-10 years? Where is there room for improvement? Stanley Weiner: Advancements will continue but improvements will always be about the bottom line, making it cheaper and more economical to use. It can only get cheaper and more efficient at this point. Listen, we used to think fresh water was endless, and we squandered it. Not any longer. Now we need to squeeze every drop out of brackish reservoirs and oceans desalination operations. There is no turning back the tide now. It’s already the new ideal: The technology uses no chemicals or filtration and requires very little power, and at the end of the process you have clear, fresh water. The revolution has begun. James Stafford: So at the end of the day, from an investor’s perspective, the water revolution could outshine the financial glitz of the shale revolution? Stanley Weiner: You know, when we initially set up shop with STW, we were simply planning on targeting frack water in the oil business. We didn’t see further than that. It didn’t occur to us that there were endless possibilities for actually accessing and processing water that no one would have thought could be for human consumption. Once we realized the potential here—the potential that goes so far beyond the oil and gas industry—our goals became clearer. We can provide water not only to the oil and gas industry and to every other industry, but to municipalities in dry states; to communities. There is a great deal of money to be made in what amounts to conservation at the end of the day, and for once it can be made without harming the environment. That is exactly what is revolutionary about it. Everyone benefits. James Stafford: What’s the bigger picture here? Stanley Weiner: This is all about conservation, and the first chance we have seen where it is possible to actually make money on conservation. If a project can be energy efficient—such as the pilot Salttech project in Mentone, Texas, which is run entirely on solar power—and can process vastly more than it rejects, then we are talking about conservation. We are wasting our precious fresh water resources every minute of every day when we could be reusing it. Everyone needs to realize that water is our most precious commodity and it needs to be conserved in every way possible. It is as simple as this. If something is free,people will use it and waste it without any regard to its importance. Then it becomes scarce and all these technologies emerge to summon a rabbit from the hat. Put a meter on water usage. If farmers have to pay even a nominal amount for water just a small amount, then suddenly your issues will disappear. The costs will be passed on to consumers or production will move to areas where water is more plentiful such as the great lakes. Maybe when people experience the cost of clean water, then less people will pollute the waterways and more people will conserve through drip irrigation or watering at night where you dont lose half your supply to evaporation. Our country has a surplus of grain that we export, how about dialing back production in drought prone areas to allow aquifers to be naturally replenished. An increase i food prices will ultimately result which may induce people to stop feasting on fat laden fast food until they wind up getting diabetes or heart disease. I had a little trouble picturing how the Salttech system works in earlier articles and interviews. This, and other recent news articles on Salttech DyVaR, help! No question that something like this water purification system is needed. As the article points out, it not only needs to work, it needs to be economical -- including the real cost of process waste. As I understand it, the process is a lot like using water as a refrigerant in a vapor-compression cycle. And heat of compression is captured for use in vaporizing unpotable water. I'd be interested to see what the electrical requirements are for the series of compressors located up-top in the compressor skid. Product literature alludes to solar power for the process. I'm wondering about the size of the solar PV array needed to provide a net 100% of the power (in conjunction with a net-metering grid connection).